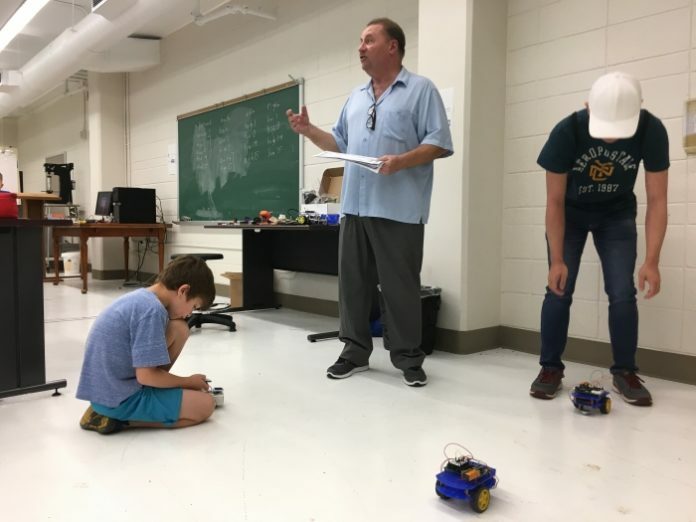 Northwestern State engineering technologist Curtis Desselles teaches kids about how robots move earlier this week as robotics campers Kale Moffit (left) and Albert Chen control their own robots in Williamson Hall. Desselles has been organizing robotics camps for eight years at NSU with the goal of sparking local youths' interest of math and science. NATCHITOCHES – Robots wheeled around the floor of a Northwestern State classroom, dodging kids’ flailing limbs and maneuvering around tables and chairs. Kale Moffitt is smiling with a remote control in his hands, making his robot’s arms grab a flag after moving forward and backward. Moffitt is one of 25 kids attending the first of four robotics camps hosted by NSU’s Department of Engineering Technology. Curtis Desselles is in his eighth summer of organizing the free robotics camps, attempting to foster an interest in math and science in the youth of a nation ranking in the middle of advanced industrial nations on international tests in those subjects. Anna McMullen bellies up to a computer, changing numerical values in a program to change a robot’s blinking light from pulsing slowly to pulsing quickly. “I like building things and learning how robots work,” McMullen said. Desselles hopes the younger kids return in the future for his advanced robotics camps, which focuses on robot programming and using to Bluetooth to communicate with robots. Desselles receives help to run the camps from assistant professor Dr. Nabin Sapkota and Louisiana School student Albert Chen. The camp was put on through a partnership between Northwestern State and the Natchitoches Community Alliance with funding from grants associated with the United Way of Northwest Louisiana. The camps, which run through the end of July, are fully booked with 125 total kids.